We have scoured the south of England to find a supplier who can support a club the size of Guildford with online ordering, quality products and a high expectation of service levels. We are delighted to welcome Hawkinsport into the Guildford family as our official kit supplier. Hawkinsport currently service hundreds of schools and sports clubs, including many Hockey clubs, throughout the south of England and provide an extensive range of hockey kit and equipment. 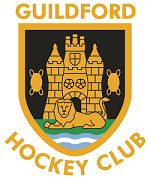 Rob Hawkins and Martin Sell are managing the Guildford relationship. As you may have read in InTouch, our members' kit survey resulted in a win for Adidas as our Kit manufacturer to co-incide with the new kit policy. The new policy states that all playing members in the U12 age groups through to adults will purchase their own home (white) playing top and each member will be issued a unique club number that will be printed onto the back of their playing shirt. U10s and under are welcome to buy a playing shirt (while not mandatory, we think the new kit is so nice everyone will want to buy one). The Adidas hockey range of kit changes slightly every four years to coincide with the Olympics games. The T16 range is brand new and will be revealed in Rio for the teams wearing Adidas, of which GB is one. You will start to see official GB kit (red, blue and white) that will look like ours (white, maroon and blue). Hawkinsport will be stocking our home playing kit to ensure we have a good level of availability moving into the coming season and onward. We have provided them an estimate of numbers of players in each age category but not a thorough analysis of exactly how many of which size to stock - it is in our best interests to start ordering kit as soon as possible in order for the 6 week delivery time for bespoke items to be met so that we can start the new season with new kit for as many players as possible. Please have a look at the extensive range of sample kit now available in the clubhouse (the physio room) to try on sizes. (Note the sample kit is blue not our home colour which is white.) And then please order your kit using the above link to the Hawkinsport GHC Kit Shop. The sooner we get orders through, the more likely everyone will be to get the size shirt they would like before the start of the season. Priority will be given on a first order first serve basis. For away kit, the Club have a few sets of the previous maroon shirts available and we will transition to the new T16 Adidas maroon shirts during the season. We encourage teams to get a sponsor for an away set of shirts - please your age group manager or squad captain (or with any general questions). Away shirts (maroon) can also be purchased by individuals with their unique number on the back. Sweatshirts, hoodies and track suit bottoms are also now available with a shorter delivery time (these are not bespoke so take less time to source). The sample kit room (old physio room at the top of the GHC stairs) will be open during the Wednesday evening mixed hockey nights 7:45-9:00 and at any time the clubhouse is open for events. Please keep the kit in the clubhouse, it is not to be removed. Please note the sample playing shirts/skorts/shorts are not in the exact new club colours, they are for sizing purposes only. The sample sweatshirts and hoodies are in the club colours. Here is our Ladies 1st XI Captain, Libby Leadbeater, modelling our Ladies 1s away team shirts - Thank You, Hawkinsport! !